One of the things I love to arrange (and discuss) is the wedding cake. I never get bored of seeing pictures of cakes (my love of eating cake may have something to do with it). The more elaborate the better, in my view, although please bear in mind the heat, when deciding on your cake. Especially in July and August, when the heat is at its peak, humidity levels are high and cakes like to sweat and melt (like the rest of us). There is so much choice now, I’m sure you can always get something you love, to suit your budget, theme or colour. We, personally, have a few bakeries that we work with. One for the 'standard' cakes, (that are included in our packages), and the other two depending on what special design your cake is. These are trusted suppliers who meet all the food safety and trading standard requirements and they, each, can create some fabulous works of art! Just look at some of the detail that goes into these cakes in the pictures attached. 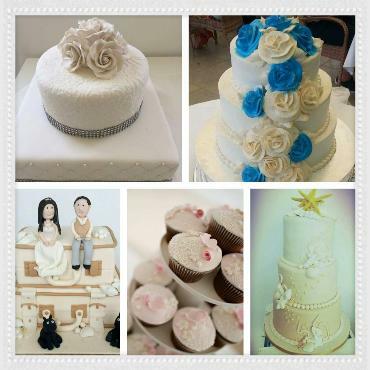 The top two pictures are our standard cakes (which seems such an inappropriate word when you look at the detail that goes into them), and the bottom pictures are some of our brides personally requested creations. With the ample choice of flavours for the sponge also, you really are spoilt for choice, and a lot of thought has to go into making this decision, and making sure you get the right cake, for you, on your wedding day. Your cake is the last piece of your decoration puzzle and can pull all your ideas together, in a single tier (or cupcake) of scrumminess.